To create a just and equitable society and the diverse leadership to sustain it. 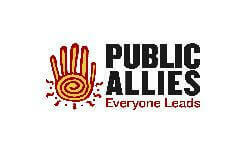 Public Allies employs integrated strategies to develop the next generation of leaders and re-define leadership for our times. The Public Allies signature AmeriCorps Ally Program identifies diverse young adults and prepares them for leadership through paid full-time nonprofit apprenticeships and rigorous leadership training. Our Alumni Programs connect and engage the growing Public Allies network of diverse leaders and invests in those positioned to make the greatest impact. Since 1992, over 6,000 Allies have completed the program with more than 75% continuing careers in nonprofit and public service. We help identify emerging leaders and train them to be inclusive, collaborative, asset-based, reflective, innovative, and accountable community builders. But we don’t do it alone. We work with nonprofit partners to expand and improve community services, engage more leaders, and foster collaboration to make positive community change happen. The VISTA team leader will be charged to enhance VISTA projects and member effectiveness by facilitating the VISTA team, supporting team members in their work, and monitoring member monthly reports. Public Allies serve in full-time apprenticeship positions at local nonprofits, where they create, improve and expand services that address issues including youth development, education, public health, economic development, and the environment. In addition, Allies participate in a rigorous leadership development program in which local community leaders and experts lead workshops to build the leadership skills of Allies. Allies also participate in community building activities, contribute to team service projects, and receive individual coaching to support their professional development during their apprenticeship.